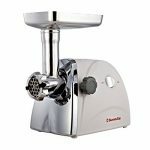 The Sunmile SM-G33 ETL Stainless Steel Meat Grinder Max 1HP 800W is a perfect gift for your dear mother. It does the family a favor by reducing the hassle of meat processing. This grinder has a large aluminum tray that holds a generous amount of meat. With a powerful and durable motor, the SM-G33 ETL grinder can process up to 170 lbs of meat in just one hour. It features only one button with on, of and reverse functions to ease operation. The entire electrical machine is stainless steel wrapped to ensure durability. 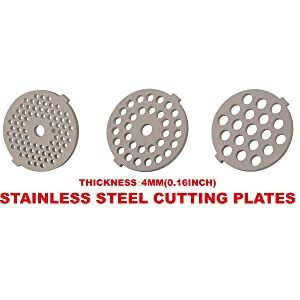 It will relieve you from the heavy and tedious kitchen grinding work. 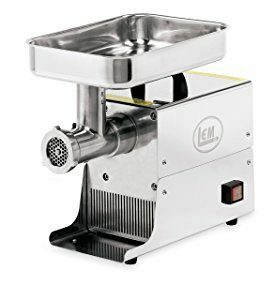 This is a full, unbiased review of the SM-G33 ETL electrical meat grinder. This grinder has a 400W rated power and a maximum locked power of 800W. 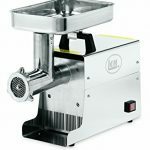 Thus, it is a very powerful meat grinder that will offer you unsurpassed processing. It is also power efficient and ideal for home use. The SM-G33 ETL is UL approved, and thus it is safe and healthy for use. 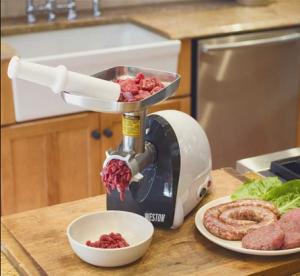 Unlike other meat grinders that have confusion buttons, this machine has only one button. This button features ON, OFF, and Reverse functions so you will have the convenience of processing your meat with a single click. The reverse function quickly repositions the trapped meat pieces smoothly to maximize your output. The repositioning of trapped ingredients also makes it easy to clean the grinder. There is also an efficient circuit breaker locked in that prevents accidents and prevents the machine from damages like motor burnout. The entire body of this machine is wrapped with a stainless steel to make it durable. You will appreciate extended use when you acquire this grinder. It also includes a Die-cast aluminum grinder head. The other parts accessories of this grinder also ensure durability since they are stainless steel and a sturdy plastic pusher. The whole machine is built to last. Although it is a relatively large electrical grinder (it measures; 13.58H x 6.18W x 13.58D inch), it is lightweight (8.8 lbs). Therefore, you will enjoy moving this grinder around. The sunmile sm-g33 features a square aluminum tray that holds a large amount of meat for fast processing. The meat tray is also removable to allow easy washing. 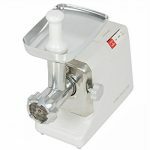 Whether you are grinding meat for your food or processing dog food, you will not waste a lot of time. 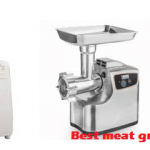 This electrical meat grinder can process up to 170 lbs of meat per hour – this is a fast processing speed as compared to similar grinders. It comes with highly endurable gears and gearbox that tackle even the toughest meat. 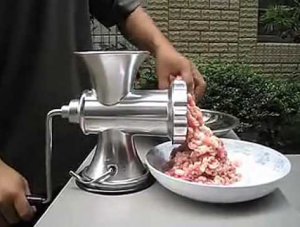 With these gears, you can also include small bones in your meat especially when processing dog meat. 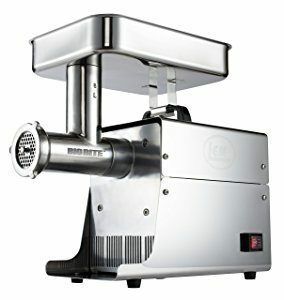 This grinder produces low noise, and thus it is not annoying when grinding all meat types. It has efficient ventilation that ensures effective air circulation in the motor to produce powerful grinding. Some meat grinder manufacturers don’t offer a warranty. However, the manufacturer of this grinder offers a one-year limited warranty. You can quickly contact their technicians who will answer all your questions. Single button for easy operation; includes reverse function and a circuit breaker to prevent accidents and motor burnout. 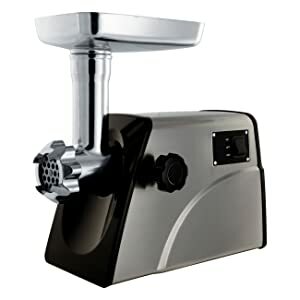 This electrical meat grinder high scores and has many positive customer reviews. However, it has a few disadvantages that don’t lower its quality. The sunmile sm-g33 is a great purchase, and it comes at an affordable price. When you grab this unit, you will appreciate a fast grinding speed of up to 170 lbs per hour. It comes with all the essential accessories for instant grinding.